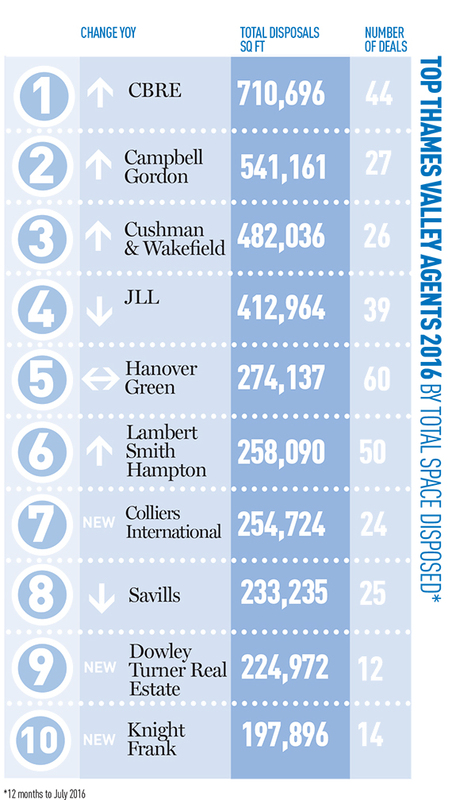 CBRE has rebounded to the top of the Western Corridor office league table. Amid falling take-up and deals, it doubled both its disposals, to 711,000 sq ft, and deal numbers, to 44, to storm over 250,000 sq ft clear at the top. Unlike previous years, a town centre deal was the largest overall. The 182,000 sq ft letting of 1 Forbury Place in Reading to SSE helped propel CBRE and Campbell Gordon to the top two places. Large business park deals were still struck, with Thales and Bayer taking 111,000 and 80,000 sq ft respectively at Green Park in Reading, jointly brokered by Campbell Gordon and Cushman & Wakefield. Overall take-up has dropped by 21% year-on-year to 3.5m sq ft, and deal numbers slid to 689; an 18% decrease. Campbell Gordon Despite acting on 17 fewer deals than last year, Campbell Gordon increased total take-up by a massive 87% to 541,161 sq ft, thanks in large part to acting on the three largest deals overall in Reading, at Forbury Place and Green Park (above). Strutt & Parker After rising up to first place last year, the big-ticket deals which characterised that success were in short supply this time. A deal average of 7,500 sq ft sees last year’s winner drop out of the top 10.